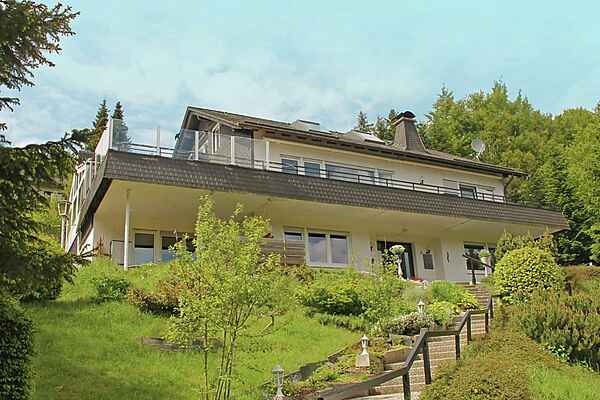 This spacious villa is peacefully located on the outskirts of the centre of Willingen, in the heart of the Sauerland. The villa has a modern interior and offers a stunning view of Etterlsberg mountain, the Ruthenaartal valley, and Willingen. In the charming living room, you'll spend the colder nights warm and cosy by the wood-burning stove. You'll have breakfast with the whole company in the winter sunroom and enjoy the summer sun with a barbecue out on the terrace. The owner can organise activities and meals for you (upon request). This villa is especially suited for families. (Not accessible for invalids because of the many stairs around this house) From the villa, you'll take lovely hikes through the woods and (mountain) bike trips. There are clearly marked trails for mountain bikers, at various levels of difficulty. The ski piste is just 1.7 km away and the quaint centre of Willingen, with its outdoor cafes, shops, and restaurants, is 1.8 kilometres away. There is also an extensive network of ski pistes, a covered skating rink, a summer luge track, and a tropical swimming paradise. Winterberg is less than half an hour away.